***LOCATED IN OAK HILLS PREMIER GATED COMMUNITY OF QUAIL SUMMIT ESTATES***RARE OPPORTUNITY AS THIS NEIGHBORHOOD CONSISTS OF ONLY 25 ESTATE HOMES, RARELY ON THE MARKET, SITTING ON +/-2.50 ACRE PARCELS IN THIS COMMUTER FRIENDLY LOCATION. 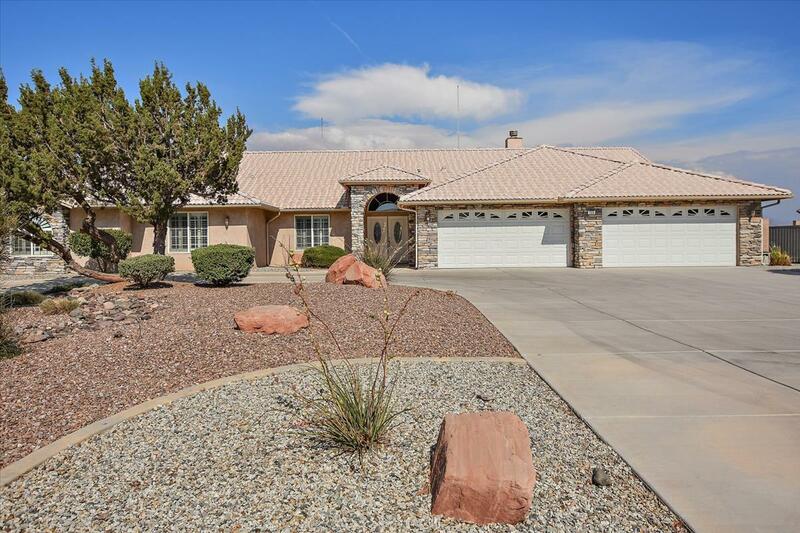 THIS EXQUISITE SINGLE STORY HOME SHOWS PRIDE OF OWNERSHIP & IS IN IMPECCABLE CONDITION. HOME BOASTS A FIVE BEDROOM SPLIT FLOOR PLAN FEATURING TWO EN-SUITE MASTER BEDROOMS. THE LARGE MASTER SUITE ALSO HOSTS A SEPARATE BONUS ROOM PERFECT FOR EXERCISE, OFFICE, SITTING OR HOBBY ROOM WITH PATIO ACCESS. DESIGNED FOR ENTERTAINING THIS HOME HAS A SEPARATE COMBO FORMAL LIVING & FORMAL DINING AREA PLUS A FAMILY ROOM ACCENTED WITH A FIREPLACE & A LARGE DINING NOOK AREA OFF OF THE KITCHEN. THE GOURMET KITCHEN HOSTS STAINLESS STEEL APPLIANCES, A DOUBLE OVEN & LOADS OF COUNTER SPACE WITH A BREAKFAST BAR. HOME OFFERS THREE LARGE FULL BATHS & LAUNDRY HAS IT'S OWN ROOM WITH A SOAKING SINK, CABINETRY PLUS A LARGE WALK IN UTILITY STORAGE ROOM WITH SHELVING. HOME ALSO FEATURES A FOUR CAR GARAGE WITH PLENTY OF PARKING AREA & STORAGE SPACE. PROFESSIONALLY LANDSCAPED WITH DROUGHT TOLERANT LANDSCAPING, FRUIT TREES & PLENTY OF ROOM FOR A POOL & SPA, THIS LARGE BACKYARD PROVIDES AMPLE SPACE FOR ALL YOUR OUTDOOR CREATIVITY. SCHEDULE YOUR PRIVATE SHOWING TODAY. All information deemed reliable, but not verified. Buyer is advised to satisfy themselves by rights of investigation and verification. Directions: 15 Fwy North Exit Right To Ranchero Rd. Left Onto Outpost Rd, Right Onto Tierra Linda Ln., Left Onto El Manor Rd. Home On The Right.